We are pleased to present our Event Creations that have been carefully selected for your dining pleasure. Our incredible team of culinary experts, led by Executive Chef Stewart Schmidt, will impress you with a fabulous selection of Canadian inspired cuisine. Our wine list is one of the finest in Mississauga, and has been the recipient of the Wine Spectator Award of Excellence. Mississauga’s only CAA 4-Diamond Restaurant This is our main dining room, serving breakfast, lunch and dinner. This beautiful room features floor to ceiling windows overlooking the Credit River. Parties may reserve tables for up to 25 guests, and dine from either our Limited à la Carte menu, preset Plated Menu, or Wine & Dine menus. Groups less than 10 may choose from our Full à la Carte Lunch/Dinner Menu. Conference guests may enjoy the Breakwater Daily Buffet when available. This gorgeous room features three antique crystal chandeliers and a small private terrace. An optional dance floor is available for a social function. Round tables are dressed in white linen, napkins and votive candles. The entire ballroom may seat up to 250 guests for a dinner and dance. The ballroom divides into three smaller sections: Port Credit South – accommodating up to 90 guests Port Credit Centre – accommodating up to 60 guests Port Credit North – accommodating up to 110 guests Guests may dine from a set plated menu or an in-room buffet. Exclusive private rooms available for breakouts, smaller meetings and private dinners. This charming dining room features one long table seating up to 16 people. Private parties may select from our Limited à la Carte menu or a set Lunch/Dinner Plated Menu. 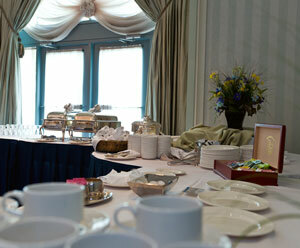 Conference groups with greater than 5 participants may enjoy a private in-room buffet.